Leukaemia is cancer of the white blood cells and bone marrow. Sometimes it is simply called blood cancer. Blood is made up of blood cells, which move around in a liquid called plasma. Blood cells are made in the bone marrow. This is a spongy material in the middle of our bones. Normally, millions of new blood cells are made every day to replace old and worn-out blood cells. White blood cells are an important part of your body’s defence against disease (immune system). 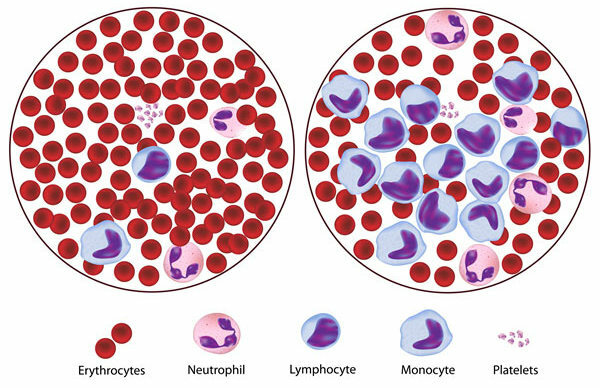 There are different types of white blood cells which fight infection in different ways. Lymphocyte white blood cells, which develop from lymphoid stem cells. Lymphoid cells develop slowly, are more specific and target certain types of infection. If leukaemia affects these cells its called lymphocytic leukaemia. Granulocyte white blood cells, which develop from myeloid stem cells. Myeloid cells are the body’s quick defence against general infection. If leukaemia affects these cells its called myeloid leukaemia. If leukaemia develops, immature blood cells continue to grow quickly but do not mature into white blood cells. These immature cells do not enter the blood stream. Instead they fill up the bone marrow and prevent normal blood cells from growing there.